How do we relate to technology? How does it relate to us? These are important questions, particularly in light of the increasingly ubiquitous and often hidden roles that modern computing technology plays in our lives. We have always relied on different forms of technology, from stone axes to trains and automobiles. But modern computing technology has some important properties. When it incorporates artificially intelligent programmes, and utilises robotic action-implementation systems, it has the ability to interfere with, and possibly supersede, human agency. Some of this interference might be desirable. If a robotic surgeon can increase the success rate of a risky type of surgery, we should probably welcome it. But some of the interference might be less desirable. I have argued in the past that we should have some concerns about automated systems that render our public decision-making processes more opaque. Either way, we should think seriously about the different modalities and styles of relationship we can have with technology. To this end, a general taxonomy or framework for understanding our relationships with technology would seem desirable. Embodiment Relationship: The technology is perceived to be part of us (part of our bodies). For example, my eyeglasses are simply part of my extended body; they are integral to how I perceive and interact with the world. Hermeneutic Relationship: The technology analyses and interprets the world for a human user. For example, google maps does this for me when it comes to working out where I need to go. Alterity Relationship: The technology is perceived as being something alien or ‘other’ in nature. For example, some people have this reaction to human-like robots. Background Relationship: The technology is either so ubiquitous and commonplace that it is ignored, or it is actually hidden from most humans. For example, certain forms of surveillance technology are like this — we don’t even notice all the CCTV cameras that watch us on the streets everyday. I think there is value to this taxonomy, but it is deliberately limited in its purview to the phenomenological character of our relationships with technology. In the remainder of this post, I want to take a look at a more complicated taxonomy/framework. This is one that was proposed in a recent article by Marlies Van de Voort, Wolter Pieters, and Luca Consoli (hereinafter ‘Van de Voort et al’), and although it builds upon Ihde’s taxonomy, it tries to focus specifically on the ethical implications of different types of computing system. The Computer: This is an computing system, which the authors define as any system ‘that calculates output based on a given input, following a predefined script of instructions.’ They also insist that (for their purposes) such a system should be intelligent (i.e. use algorithms for decision-making), context-aware (i.e. able to perceive and incorporate information from their surrounding environment) and autonomous (i.e. capable of operating without constant human input). The Individual: This is just any individual human being that is affected by the computing system. The effects can vary greatly, depending on the relationships between the individual and the computer. We’ll talk about this in more detail below. The Third Party: This is any entity (i.e. individual, group or another computing system) that either controls, receives information from, or originally programmed and set-up the computer. The Observation Relationship: This is where the computer simply observes and collects information about the individual, which it then may or may not transmit to a third party. Surveillance systems are the exemplars of this relationship. The Interference Relationship: This is where the computer has some goal state that it must realise by interfering with individual humans. This may or may not involve control or input from a third party. Drone weapon systems are exemplars of this type of relationship, where the ‘interference’ in question can be lethal. The Interaction Relationship: This is where the computer has some direct interaction with the individual, and that interaction can come in the shape of either observation or interference. A care-giving robot would exemplify this style of relationship. 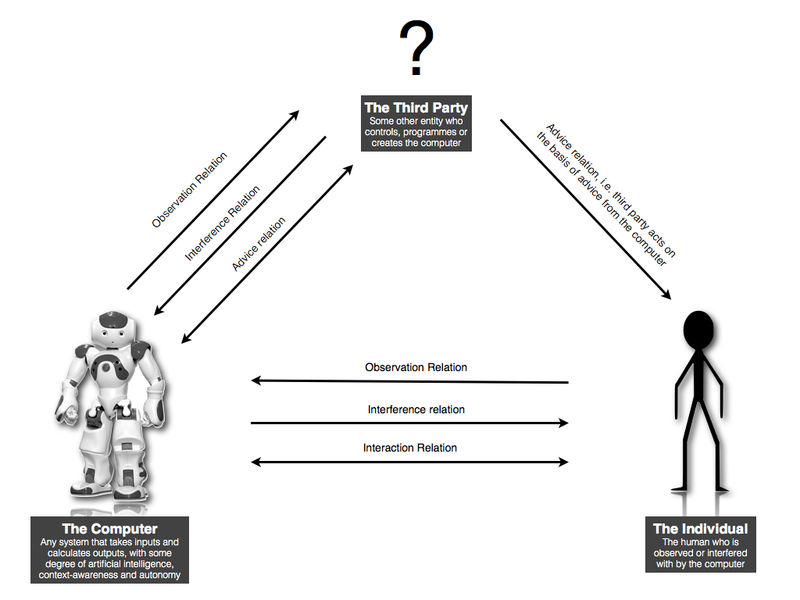 The Advice Relationship: This is where the computer gives advice to the third party, who then in turn either observes or interferes with the individual. Van de Voort et al refer to this as observation or interference via a proxy. As you can see, these relationships are not mutually exclusive. The first two are subsumed within the last two. You can think of it like this: The observation and interference relationships are the two basic forms that human relationships can take with computers. But the quality of those relationships then varies depending on whether the computer interacts directly or via a proxy with the human beings. The diagram below, which I have adapted from Van de Voort et al’s original article is supposed to illustrate these different relationships. I’m not sure how useful it is, but I offer it for what it is worth. Van de Voort et al claim that their framework is useful when it comes to understanding the ethical dimensions to computing systems. To see this, we need to do two things. First, we need to appreciate how every computing system is, at its core, an information processing system. It acquires information from the world, it organises and processes that information in some manner, and it then makes use of that information by performing some sort of ‘action’ (where that word is understood to have a fairly liberal meaning). Second, we need to consider how this information processing could take place in each of the four relationships outlined above. We start with information processing in the observation relationship. Here, the computing system is acquiring information about a human individual. Consider, for example, the way in which Facebook or Google track information about internet and social media usage. Algorithms are then used to sort and organise that information. The system must then make a decision as to what to do with that information, either forwarding it to a third party, storing it for future use, or deleting it. Obviously, there are a number of significant ethical dimensions to all of this. Questions must be asked about when and whether it is appropriate to collect, process, store, forward or delete such observational information. These are questions that are being and have been asked in the recent past. We move on then to the interference relationship. Here, the computing system has a goal that it tries to realise by acting in the world. It will use information it collects from the world to figure out what action it should perform, whether or not its goal state has been realised, and whether it needs to ‘try again’. Consider, for example, the autonomous drone weapon system. This system would have a goal (destroy terrorist target X) which it would use to devise an action plan (fire missile at terrorist target X), and when implementing that action plan would try to use feedback from the world to figure out whether the goal has been achieved. A third party would typically oversee this process by programming the goals and perhaps assisting with feedback and learning. Obviously, the creation of such a system involves a number of ethical issues. Is the goal morally appropriate? Is the selected action plan the most morally appropriate means of achieving that goal? When should the computer try again and when should it give up? These questions are becoming increasingly important in light of the emerging trend towards reliance on such autonomous systems. This brings us to the interaction relationship. Here, the computing system interacts directly with some human subject, either through observation or interference. Consider, for example, a household robot that assists a human with a variety of mundane chores (cooking, cleaning, ironing, etc.). The robot would have a number of goal states (keep the house clean, cook the food etc.) but a constantly shifting set of sub-goals, depending on what needs to be cooked and cleaned and in what order. It will also need to work in and around the human living in the home. Again, this will have a number of ethical dimensions to it. The computer system will need be efficient and to take into consideration the wishes and desires of the human users. We arrive then, finally, at the advice relationship. Here, the computer will evaluate and interpret information inputed into it from the environment. It will then use this to issue advice to third parties. The computer will need to decide when and whether to issue that advice, and the precise form that the advice will take. Consider, for example, a medical diagnostics robot that uses information to come up with the most plausible diagnosis for a medical patient, and maybe also suggest possible treatment courses. This will clearly have a number of ethical dimensions to it. The reliability of the information will need to factored in, as will the accuracy of the advice and the likely degree of reliance that will be placed on this advice. Will the third parties rely on it completely, or will they simply ignore it? In the end, having considered the ethical dimensions to these four different relationships, Van de Voort et al argue that designers of such systems face three big ethical questions. The first concerns the scope of the system, i.e. which kinds of information or action fall within or outside its zone of responsibility. The second concerns the impact of the system on the environment in which it operates, i.e. the directness and immediacy of its effects. And the third concerns the involvement of human and other systems, i.e. does the system operate in isolation from, in contradistinction to, or in harmony with others. This is a very quick overview of Van de Voort et al’s framework. 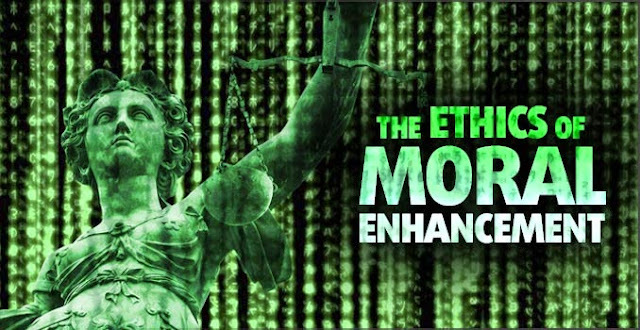 To briefly recap, they try to develop a framework for understanding modern computing systems and the types of ethical issues that arise with these systems. The framework centres on three actors (the computer, the individual and the third party) and four relationships (observation, interference, interaction, advice). I have mixed feelings about their proposed framework. I think their focus on the tripartite relationship between computer systems, individuals, and third parties is useful. I also think there is something to their claims about the four different relationships, though what they have ended up with is quite messy and imprecise (since there are many different kinds of interaction and observation). Where I have some major problems is with the value of all this when it comes to assessing the ethical implications of different systems. In essence, all they really say is that we need to think about the ethical implications of data collection and action-implementation by computerised systems. I certainly agree that we should think about these things, but that observation in and of itself is pretty banal. I am not sure that we needed the complex framework to draw our attention to those issues. To be sure, every taxonomy and framework will have its problems. If nothing else, they will all tend to omit important details and nuances. We cannot expect perfection in this respect. But I think it might be possible to do better. If you read a book by an alleged eyewitness to a miraculous event, should you believe that the event occurred? Hume’s argument against the plausibility of believing in miracles on the basis of testimony is probably the most famous contribution to the philosophical debate on this question. It is also the most hotly contested and debated. 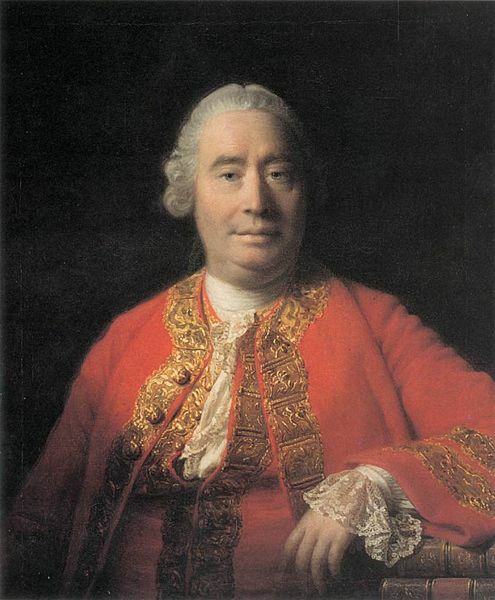 Some people think that Hume’s argument is eminently reasonable, a shining example of his insatiable common-sense approach to philosophical argument. Others are less persuaded, believing Hume’s argument to be either question-begging or an ‘abject’ failure. I’ve been dimly aware of these debates for a number of years. And I used to think I had a reasonable grasp of what Hume had to say. Indeed, in my recent post on Arif Ahmed’s case against the resurrection, I noted that Ahmed’s first argument is, to all intents and purposes, a reformulation of Hume’s. Nevertheless, there is one book that has been resting on my shelves for a number of years that argues we need to pay much closer attention to what Hume actually said in his original discussion. MR1: Hume thinks that no testimony could ever be sufficient to establish the occurrence of a miracle. MR2: Hume thinks that an a priori argument suffices to make his case against miracle claims. These misreadings stem from the failure to appreciate the intimate connection between the two parts of Hume’s original text. Part one deals with standards for evaluating testimony relating to miraculous events. Part two looks at specific historical examples of such testimony. Many critics (and supporters) of Hume treat the two parts as hermetically sealed wholes. And when read in this light it can indeed appear as if the first part presents a purely a priori argument against miracles and that this argument is based entirely on the notion that testimony could never establish the truth of a miracle. But these really are misreadings. Hume openly admits that testimony could be sufficient to establish a miracle (he just thinks the standard of proof is pretty high); and he doesn’t limit his discussion to the a priori realm. Over the next two posts, I want to examine Hume’s argument, as filtered through the lens of Fogelin’s book, and consider whether it has continuing merit. I start today by outlining the key principles from part one of Hume’s discussion. Let me start with a general interpretive caveat. The modern trend when evaluating arguments about miracles is to cast them into the formal language of probability theory, specifically the language of bayesianism. Thus, we get lots of talk about conditional probabilities, prior probabilities, background evidence and posterior probabilities. This is all well and good, and for anyone who is well-versed in this language, it is relatively easy to see how Hume’s argument can be recast in those terms. But it is important to bear in mind that Hume himself did not adopt this language. In fact, Bayes theorem was only formulated in response to Hume’s work. Instead, Hume writes in an intuitive and colloquial fashion about the nature of probability. In what follows, I stick with Hume’s original language and abjure the formal garb of probability theory. With that caveat out of the way, I’ll proceed to discuss the main features of part one of Hume’s Of Miracles. The first, and most important, of these is Hume’s proposed method for evaluating testimonial claims. Hume starts with the general guiding principle that ‘a wise man proportions his belief to the evidence’. The question then becomes the relative weight that should be assigned to testimonial claims in favour of miracles. (i) There are many witnesses, not few. (ii) The witnesses concur with one another rather than contradict one another. (iii) The witnesses are of unimpeachable, rather than of doubtful character. (iv) The witnesses are disinterested, not interested, parties. (v) The witnesses present their testimony in measured tones of confidence, rather than with hesitation or too violent asseveration. The reason, why we place any credit in witnesses and historians, is not derived from any connexion, which we perceive a priori, between testimony and reality, but because we are accustomed to find a conformity between them. But when the fact attested is such a one as had seldom fallen under our observation, here is a contest of two opposite experiences, of which the one destroys the other, as far as its force goes, and the superior can only operate on the mind by the force which remains. Reverse Test: The probability-raising potential of reliable testimonial evidence for X must be assessed relative to the prior probability of X. If X was highly improbable, then the effect of reliable testimony is proportionally diminished. Hume’s point is that whenever we evaluate the testimony for a claim we must do so by factoring in both the direct and the reverse tests. We need to consider whether the evidence ‘passes’ both tests, where ‘passes’ is understood to mean something like ‘renders X more likely than not’. 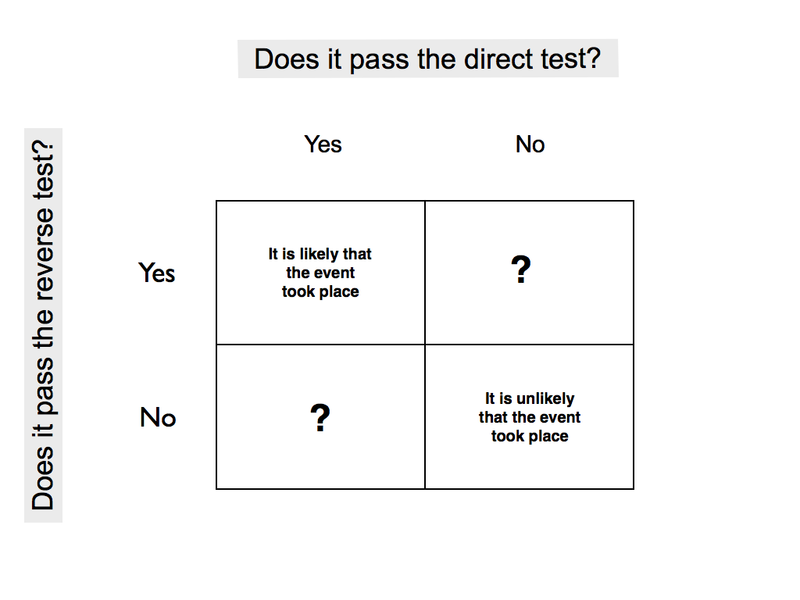 We can represent this testing process using a two-by-two matrix. Whenever testimony fails or passes both tests, we have a relatively straightforward situation. In the former case, we’ll assume that the event did not occur; in the latter case, we’ll assume that it did. The tricky cases arise whenever there is a clash between both tests. What do we do then? Answering that question is the key to Hume’s argument in the first part of Of Miracles. It is also key to the misreadings of his position. As we shall see, when we move on to discuss part two, Hume thinks that testimony for miracle claims typically fails both the direct and reverse tests. In this sense, dealing with testimonial evidence for miracles is relatively trivial. Nevertheless, in part one, he tries to imagine the scenario in which the testimonial evidence for a miracle passes the direct test but then rubs up against the the reverse test. A miracle is a violation of the laws of nature; and as a firm and unalterable experience has established these laws, the proof against a miracle, from the very nature of the fact, is as entire as any argument from experience can possibly be imagined…There must, therefore, be a uniform experience against every miraculous event, otherwise the event would not merit that appellation. And as a uniform experience amounts to a proof, there is here a direct and full proof, from the nature of the fact, against the existence of any miracle; nor can such a proof be destroyed, or the miracle rendered credible, but by an opposite proof, which is superior. There is a lot in this short passage, and a lot that can be misunderstood. It is important that we unpack it carefully. First, note the general definition of a ‘miracle’ that Hume employs. He says that a miracle is something that is contrary to a law of nature and that there will tend to be uniform experience in favour of that law. For example, we have almost uniform testimony establishing that people, once dead, do not rise from the dead three days later. This means that it is extremely improbable that the alternative should happen. If somebody testified that a person did rise from the dead (or if even several people testified to that effect) it would not be sufficient to establish the truth of that miracle. 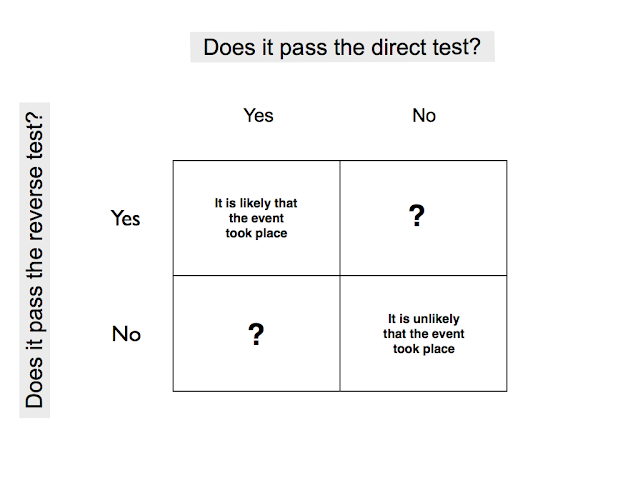 The reverse test would overwhelm the direct test. [N]o testimony is sufficient to establish a miracle, unless the testimony be of such a kind, that its falsehood would be more miraculous, than the fact, which it endeavours to establish: and even in that case, there is a mutual destruction of arguments, and the superior only gives us an assurance suitable to that degree of force, which remains, after deducting the inferior. This is the nub of Hume’s argument in this first part. It might benefit from being reformulated in the language of probability theory, but its gist is tolerably clear. He is not mounting a full argument against the plausibility of testimonial evidence for miracles. He is simply pointing out that the standard is exceptionally high. The direct test would have to completely overwhelm the reverse test for us to be in any way confident about the occurrence of a miracle, based solely on testimonial evidence. The probability that the witnesses are telling a lie (or otherwise misleading us) would have to be less than the probability that the miracle took place. Okay, this brings us to the end this post. To briefly recap, Hume’s argument in part one of Of Miracles is relatively modest in its scope and effect. It is focused purely on methods for evaluating testimonial evidence and how those methods might apply to testimonial evidence in favour of miracles. He is not mounting an a priori argument against the occurrence of miracles; nor is he assuming that testimony could never be sufficient to establish the truth (probabilistically speaking) of a miracle. He is merely arguing that the standard of proof is exceptionally high. I’m pretty sympathetic to what Hume has to say. I certainly concur that the standard of proof is high when it comes to accepting testimony in favour of miracles. But I think there are problems with the application of Hume’s evaluative method. I think many religious believers are inclined to disagree that the prior probability of miraculous events is exceptionally low. Indeed, I have read religious believers who think that miracles are a common everyday occurrence. It might be possible to test their convictions on this score. The best way to do this would be by pointing out how they reject most miracle claims. For instance, one could highlight the fact that the Catholic church rejects most miracle claims associated with holy sites and putative saints. Evaluating the rate of approval of such miracle claims would establish a fairly low prior probability for any particular miracle claim (albeit maybe not as low as the one Hume claims). But there is a good deal of argumentative work to do on that front before Hume’s method will become acceptable to the typical religious believer. I’ll continue the analysis of Hume’s argument in the next post. 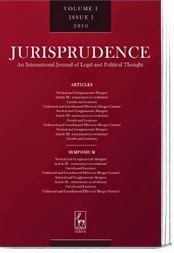 I have a new paper coming out in the journal Jurisprudence. It's one of my legal philosophy pieces. It tries to apply certain ideas from linguistic philosophy to debates about constitutional interpretation. Specifically, it looks at an interpretive theory known as originalism (often beloved by conservative legal scholars) and a linguistic concept known as pragmatic enrichment (the fact that the meaning of an utterance is often enriched by the context in which it is uttered). Originalists think that we ought to interpret constitutional texts in accordance with their original meaning. I use a range of ideas, including some ideas from Steven Pinker (and colleagues') theory of strategic speech and common knowledge, to critique some of the core commitments of originalism. Full details are below. The official version of this paper won't be out for awhile, but you can access a pre-publication version of it below. Abstract: The meaning of an utterance is often enriched by the pragmatic context in which it is uttered. This is because in ordinary conversations we routinely and uncontroversially compress what we say, safe in the knowledge that those interpreting us will “add in” the content we intend to communicate. Does the same thing hold true in the case of legal utterances like “This constitution protects the personal rights of the citizen” or “the parliament shall have the power to lay and collect taxes”? This article addresses this question from the perspective of the constitutional originalist — the person who holds that the meaning of a constitutional text is fixed at some historical moment. In doing so, it advances four theses. First, it argues that every originalist theory is committed to some degree of pragmatic enrichment, the debate is about how much (enrichment thesis). Second, that in determining which content gets “added in”, originalists typically hold to a common knowledge standard for enrichment, protestations to the contrary notwithstanding (common knowledge thesis). Third, that the common knowledge standard for enrichment is deeply flawed (anti-CK thesis). And fourth, that all of this leads us to a thin theory of original constitutional meaning — similar to that defended by Jack Balkin and Ronald Dworkin — not for moral reasons but for strictly semantic ones (thinness thesis). Although some of the theses are extant in the literature, this article tries to defend them in a novel and perspicuous way. This post is a slightly polished-up set of notes I took while watching Arif Ahmed’s debate with Gary Habermas on the plausibility of the resurrection. The debate is quite old at this stage (probably 7 or 8 years at least), and I watched it quite some time ago, but it is often highly regarded among internet atheists. Why? Because it is one of those cases in which the non-religious party seems to have got the better of the argument. I’m not a huge fan of public debates myself. I see some value to them in relation to political and social questions, but less in relation to classic philosophical questions (particularly those relating to philosophy of religion). I think dialogues are generally better. They are usually less combative and ill-tempered, and can involve some genuinely useful probing and questioning of alternative points of view. Still, I can’t resist watching the odd debate and I must confess that among atheist debaters, Arif Ahmed is my favourite. He has a relentlessly logical and well-ordered approach. He also has the advantage of being a highly competent philosopher (check out his professional work on decision theory or his books on Kripke and Wittgenstein). The success of his debate against Habermas was, I believe, down to two things. First, he tried to undercut Habermas’s entire argumentative method before Habermas had a chance to speak. Habermas, for those who don’t know, is notorious for using an ‘argument from scholarly consensus’ to support the historicity of the resurrection. Ahmed showed why that wasn’t very appropriate in a public debate of this sort. Second, Ahmed himself used some disarmingly simple arguments in his case against the resurrection. It is those arguments that I wish to summarise in this post. I know this has been done by others before, but I want to provide some elaboration and context. I do so not because I think these arguments are logically watertight and above reproach — far from it. I do so because I think the three arguments Ahmed presents provide a model for building a philosophical case against a claim in a short space of time (his speech lasts less than 20 minutes). I also do so because I want to try to understand these arguments better. I’m not well-versed on the whole miracles/resurrection debate (though I’ve written some stuff about it) and I want to learn more. For those who are interested, I have embedded a video of the debate at the end of this post. You might like to watch it before or after reading this. Resurrection Hypothesis: Jesus was crucified, died and was then raised bodily from the dead by God. This is a reasonably austere version of the hypothesis. I suspect a more detailed version could be specified that would state the rationale or justification for God raising Jesus from the dead (part of the general plan for atonement/salvation). But I’ll stick with the austere version for now. There are two things to note about the resurrection hypothesis. The first is that it depends on the truth of a factual/historical claim, namely: that Jesus died and was then seen alive several days later (in an embodied not a spiritual form). The second is that it posits a supernatural explanatory force to account for that fact, namely: God. Christians typically defend the resurrection hypothesis by using an inference to best explanation style of argument. This is what William Lane Craig does in his defence of the resurrection hypothesis. More sophisticated argumentative structures — such as those adopted by Richard Swinburne — use probability theory. I won’t go into those sophisticated versions here since Ahmed doesn’t appeal to them. He sticks to a fairly intuitive and commonsensical understanding of probability, which makes sense given the format of the debate. Unless you are guaranteed an audience of mathematicians, it is pretty difficult to give a persuasive bayesian argument in less than 20 minutes. (1) It is a historical fact that Jesus died and rose from the dead. (2) There is no naturalistic explanation that could account for this historical fact. (3) The resurrection hypothesis is the only plausible supernatural explanation for this historical fact. (4) Therefore, the resurrection hypothesis is (probably) true. I have constructed this in a way that best makes sense of Ahmed’s subsequent arguments. One thing worth noting is that this is not a formally valid argument. The conclusion does not in fact follow from the premises. This is a problem with all inferences to best explanation. They are, at best, probabilistic and defeasible in nature. The main body of Ahmed’s talk presents three argument for doubting this inference to best explanation. Let’s go through each of these now. Water Temperature1: Suppose you have a bucket filled with water and there are five thermometers in the water giving a temperature readout. Now imagine that the thermometers say that the water is 10 C. You put your hand into the water and it feels reasonably cool. Water Temperature2: Suppose you have a bucket filled with water and that there are five thermometers in the water. This time the thermometers say that the water is at 30 C. You put your hand in the water and it feels reasonably cool. Water Tempoerature3: Again, suppose you have a bucket filled with water and that there are five thermometers in the water. This time the thermometers say that the water is at 600 C. You put your hand in and it feels reasonably cool. In each of these cases we have several independent measuring devices providing us with evidence regarding the water’s temperature and we also have the evidence of our own senses. Ahmed’s question is what should we believe regarding the temperature readout on the thermometers in these three cases: Should we believe that they accurately record temperature or not? The answer varies depending on the content of the readout and our other sources of evidence. In the first case, we would probably accept that the temperature readout is accurate. The water feels cool to the touch, it is in a liquid state, and it conforms with our background evidence about how water and temperature work. In the second case, we might wonder why the water still feels pretty cool to the touch, but since our ability to discriminate temperatures based on touch is doubtful, and we have five thermometers confirming that the water is at 30 C, we would still be right to believe that they accurately record the temperature. The third case is very different. Water has never be observed in a liquid state, at sea level, at 600 C. We have repeatedly observed water at temperatures significantly higher than 100 C as being gaseous in nature. We also know, from repeated experience, that water at temperatures like that would be extremely hot to the touch. So in this case, we have strong evidence to suggest that the thermometers are misleading guides to the true temperature of the water. How does this analogy apply? Ahmed doesn’t spell it out directly but I presume the idea is that when it comes to the historicity of Jesus’s death and resurrection, we don’t have any direct evidence of what happened. We have second-hand (possibly worse than that) evidence handed down to us through a series of texts. In other words, we have a set of ‘resurrection narratives’, which may or may not join up with actual eyewitnesses to the event. These narratives are like the thermometers: they are the measuring devices for what happening in the distant past. Should we trust them? Ahmed’s argument is that our position relative to the evidence in the case of the resurrection narrative is akin to our position in relation to thermometers in the third version of the water temperature analogy. Let’s assume, for sake of argument, that the narratives do genuinely link up with original eyewitness evidence. In that case, the eyewitness accounts are akin to the thermometers. We know that eyewitness accounts can be misleading. To this effect, Ahmed cites Robert Buckhout’s famous 1975 paper on the reliability of eyewitness evidence LINK. He could have cited many more. We also know that there is near uniform evidence against the hypothesis that people, once dead, rise bodily from the dead. This near-uniformity of evidence against the possibility of bodily resurrection should cause us to doubt the testimony. (5) If we have frequently observed X’s providing an unreliable guide to the truth, and if we have never observed Y, then in any case in which X provides support for Y, it is more likely that X is misleading us than that Y is true. (6) We have frequently observed cases in which intelligent and competent eyewitnesses have lied or made mistakes about what they have seen. (8) Therefore, it is more likely that eyewitness testimony concerning Jesus’s bodily resurrection is mistaken, than that the resurrection actually occurred. The first premise of this argument (5) is effectively a modified version of Hume’s key premise in Of Miracles. Is the argument any good? I won’t give a complete answer to that right now. I think there is merit to it — particularly in light of the fact that it grants the best case scenario to the defender of the resurrection hypothesis (viz. that the Gospel accounts and the account of St. Paul are, in fact, genuine eyewitness accounts). Nevertheless, I also think that a more thorough discussion of Hume’s principle is in order, as is a more thorough survey of when exactly eyewitness testimony is likely to be trustworthy and when it is likely to be misleading. Ahmed’s first argument is, by far, his most complicated. His two remaining arguments are much more straightforward and, in my opinion, more effective. They work in that classic philosophical tradition of conceding a huge amount of ground to the pro-resurrection side, but still arguing that belief in the resurrection hypothesis is unreasonable. The first of those arguments is the argument from the historical inadequacy of supernatural explanations. The name is a bit of a mouthful but the idea is simple enough. Suppose we grant premise (1) of the original argument, i.e. we accept accept the resurrection narrative as a historical fact. This means that we believe that ancient people saw Jesus die and then say him again three days later. Even if we grant that, we still have no reason to favour a supernatural explanation over a natural explanation. This is because in all historical cases in which we did not have a viable naturalistic explanation and hence appealed to supernatural explanations, we later learned that those explanations were wrong and that there were sound natural explanations. Ahmed gives examples such as the mystery surrounding the construction of the pyramids, or the appeal to some mystical ‘life force’ to explain the difference between life and non-life. The latter was abandoned thanks to the work of scientists like Darwin and Watson and Crick. The upshot of this is that, even if we thought that the resurrection narrative was true, we should not run into the arms of the resurrection hypothesis. We should simply suspend belief. It is more likely that we will come across viable naturalistic explanation in the future. Ahmed makes a special point about hallucinations at this stage of his argument. Apologists often claim that the resurrection narrative could not be based on hallucinations of the risen Jesus because there are simply too many witnesses. For instance, in the writings of St. Paul it is alleged that 500 people saw the risen Jesus at one time, and apologists sometimes claim that it is not possible for 500 people to hallucinate the same thing at the same time. Let’s assume that this is correct. Ahmed says that this is still not a good ground for believing the resurrection hypothesis. We are still relatively ignorant about the workings of the human mind. It is more likely that there is some, as yet improperly understood, mechanism for mass hallucinations (to be explained in naturalistic terms) than that there is some supernatural force responsible for a bodily resurrection. (9) There were many historical cases in which we had no good naturalistic explanation for X at T1 but we later discovered a good naturalistic explanation for X at T2; conversely, there are no historical cases in which supernaturalistic explanations seem to win out over naturalistic ones in the long-run. (10) Therefore, in any case in which we lack a naturalistic explanation for X at T1 it is more likely that there will be a plausible naturalistic explanation for X at T2 than that any posited supernaturalistic explanation is true. (11) We do not currently have a plausible naturalistic explanation for the resurrection narrative. (12) Therefore, nevertheless, it is still more likely that there will be a plausible naturalistic explanation for the narrative in the future, than that the resurrection hypothesis is true. I know this is messy and I would appreciate any suggestions for cleaning it up. I think the main problem with it is in relation to the inference from (9) to (10). It is obviously an inductive inference. We generate the principle for denying supernaturalistic explanations from historical success cases. But is that a warranted inference? All inductive inferences are somewhat vulnerable. It appeals to me because I’m a fan of naturalistic explanations and I’m pretty closed to the idea of there ever being a successful supernaturalistic explanation. But I think the terminology being used here is vague, and I think religious believers will be disinclined to accept the inference. This brings us to the last of Ahmed’s arguments. This one is actually my favourite because I think it highlights a genuine problem for any proponent of a supernaturalistic explanation. It may also help to justify the claim I made in the previous paragraph about being pretty closed to the notion of a supernaturalistic explanation. The argument starts with a major concession to the pro-resurrection side. It concedes that there is no possible naturalistic explanation of the resurrection narrative. Consequently, the only possible form of explanation will be supernaturalistic in nature. Granting this, it still does not follow that the resurrection hypothesis is the most plausible explanation. To illustrate the problem, we can go back to Paul’s claim that 500 people saw the risen Jesus at the same time. As noted, apologists reject naturalistic explanations for this vision on the grounds that it is not plausible to suppose that 500 people hallucinate the same thing. Therefore the explanation must be supernaturalistic. But notice what is happening here: the assumption that 500 people cannot hallucinate at the same time is based on an inference from empirical and naturalistic constraints. The claim is that we have no good evidence for such mass hallucinations and we have no reason to think that there is a naturalistic mechanism that could account for that hallucination. To put it another way, we are supposing that it is empirically implausible for such a thing to happen based on what we know of the working of the human mind. But in assuming such constraints, we are sticking to the rigours of the naturalistic worldview. If we are entitled to abandon those rigours, and appeal instead to possible supernatural forces, then we are no longer entitled to those constraints. If we are going to appeal to the supernatural, then we could just as easily suppose that there is some supernaturally induced mass hallucination as that there is a supernaturally induced bodily resurrection. In other words, once we abandon the constraints of naturalistic explanation, all bets are off. There are innumerable possible supernaturalistic explanations for the resurrection narrative (maybe its all a divine lie; maybe its the product of the devil; and so on). We have no reason for favouring one over another. (13) There are no probabilistic constraints on what makes for a good supernatural explanation, i.e. if we are going to appeal to a supernaturalistic explanation for X, there is no reason to endorse one supernatural explanation over another. (14) The resurrection hypothesis is a supernatural explanation for the resurrection narrative, but there are many such explanations that may not entail an actual bodily resurrection (e.g. divine hallucination; devil’s deception etc.). (15) Therefore, there is no reason to favour the resurrection hypothesis over some alternative supernatural explanations that entail the same facts. This, again, is a little messy but I’m trying to extrapolate from what Ahmed says. I suspect theists will have a problem with this insofar as they will try to argue that not all supernatural explanations are on a par. There are some desiderata we can use when deciding between supernatural explanations and these might allow us to favour the resurrection hypothesis. I think there are two things to be said in response to this. First, it is important to realise that this argument does not claim that all possible supernatural forces must be viewed equally. The posited supernatural force must actually entail the facts (probabilistically or otherwise) it is alleged to explain. Second, I think that even if you could say that theistic explanations are better than other possible supernatural explanations, you would still be prevented from favouring one theistic explanation over another. Why? Well, as skeptical theists are keen to point out, we do not really know the mind of god. He could have beyond-our-ken reasons for allowing all manner of things to occur. But this, as critics of the skeptical theist position have pointed out, means that it is difficult to say why we should favour any theistic explanation over another. We might like to think that the bible is the authoritative and truthful word of God. But God could have beyond-our-ken reasons for deceiving us as to the historical truth. Okay, so that’s it for this post. I think it is worth finishing up by noting, once more, the nice structure to Ahmed’s case. He contests all the main parts of the resurrectionist’s inference to best explanation. He starts by challenging their reliance on biblical testimony; he then challenges their dismissal of naturalistic explanations for the resurrection narrative; and he then challenges the grounds upon which they favour the resurrection hypothesis over all other supernatural explanations. At each stage, he concedes more territory to their position, but still maintains that those concessions do not favour their preferred conclusion. This doesn’t mean that Ahmed’s arguments are infallible or overwhelmingly persuasive. There is plenty that could be challenged and disputed. But as an opening salvo in a public debate, I think it does a nice job. Some of you may have noticed my recently-published paper on existential risk and artificial intelligence. 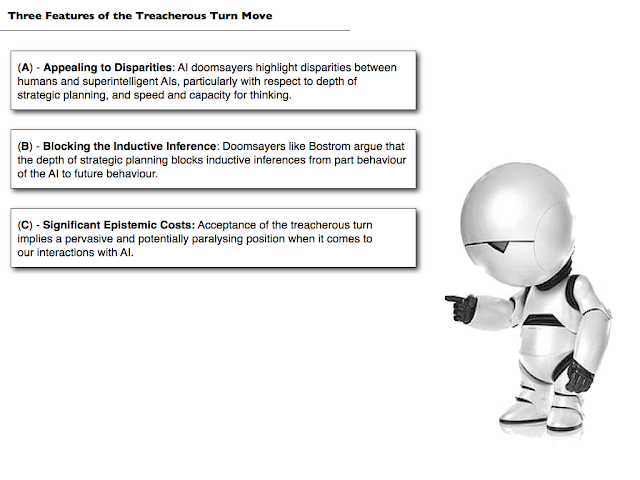 The paper offers a somewhat critical perspective on the recent trend for AI-doomsaying among people like Elon Musk, Stephen Hawking and Bill Gates. Of course, it doesn’t focus on their opinions; rather, it focuses on the work of the philosopher Nick Bostrom, who has written the most impressive analysis to date of the potential risks posed by superintelligent machines. I want to try and summarise the main points of that paper in this blog post. This summary comes with the usual caveat that the full version contains more detail and nuance. If you want that detail and nuance, you should read that paper. That said, writing this summary after the paper was published does give me the opportunity to reflect on its details and offer some modifications to the argument in light of feedback/criticisms. If you want to read the full version, it is available at the links in the brackets, though you should note that the first link is pay-walled (official; philpapers; academia). To give a general overview: the argument I present in the paper is based on an analogy between a superintelligent machine and the God of classical theism. 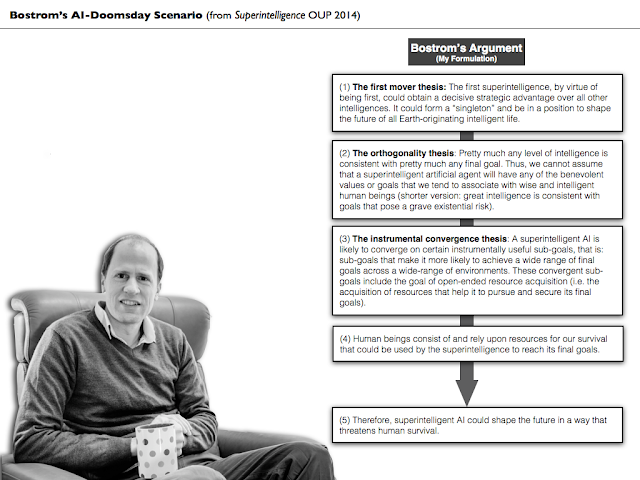 In particular, it is based on an analogy between an argumentative move made by theists in the debate about the existence of God and an argumentative move made by Nick Bostrom in his defence of the AI doomsday scenario. The argumentative move made by the theists is called ‘skeptical theism’; and the argumentative move made by Nick Bostrom is called the ‘treacherous turn’. I claim that just as skeptical theism has some pretty significant epistemic costs for the theist, so too does the treacherous turn have some pretty significant epistemic costs for the AI-doomsayer. That argument might sound pretty abstract right now. I hope to clarify what it all means over the remainder of this post. I’ll break the discussion down into three main parts. 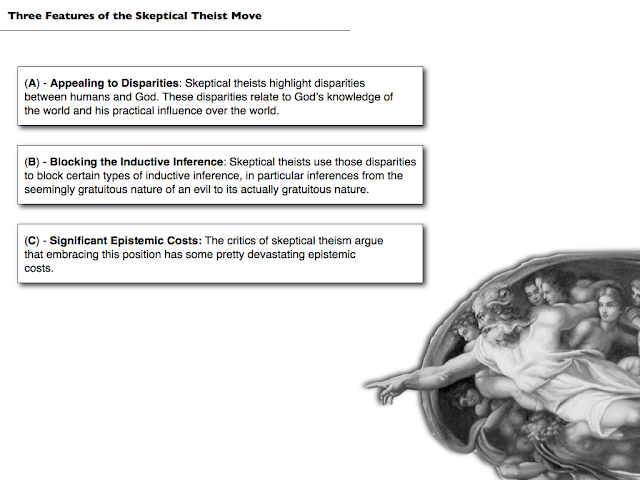 First, I’ll explain what skeptical theism is and why some people think it has significant epistemic costs. Second, I’ll explain Bostrom’s AI-doomsday argument and illustrate the analogy between his defence of that argument and the position of the skeptical theist. And third, I will outline two potential epistemic costs of Bostrom’s treacherous turn, building once more on the analogy with skeptical theism. I want to start with an interpretive point. Those who have read up on the debate about the technological singularity and the rise of superintelligent machines will know that analogies between the proponents of those concepts and religious believers are pretty common. 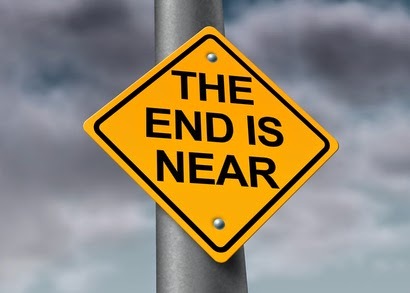 For instance, there is the popular slogan claiming that the singularity is ‘the rapture for nerds’, and there are serious academics arguing that belief in the rise of superintelligent machines is ‘fideistic’, i.e. faith-based. These analogies are, as best I can tell, intended to be pejorative. In appealing to a similar analogy there is a risk that my claims will also be viewed as having a pejorative air to them. This is not my intention. In general, I am far more sympathetic to the doomsaying position than other critics. Furthermore, and more importantly, my argument has a pretty narrow focus. I concede a good deal of ground to Bostrom’s argument. My goal really is to try to ‘debug’ the argumentative framework that is being presented; not to tear it down completely. With that interpretive point clarified, I will move on. I first need to explain the nature the skeptical theist position. To understand this, we need to start with the most common argument against the existence of God: the problem of evil. This argument claims, very roughly, that the existence of evil (particularly the gratuitous suffering of conscious beings) is proof against the existence of God. So-called ‘logical’ versions of the problem of evil claim that the existence of evil is logically incompatible with the existence of God; so-called evidential versions of the problem of evil claim that the existence of evil is good evidence against the existence of God (i.e. lowers the probability of His existence). Central to many versions of the problem of evil is the concept of ‘gratuitous evil’. This is evil that is not logically necessary for some greater outweighing good. The reason for the focus on this type of evil is straightforward. It is generally conceded that God could allow evil to occur if it were necessary for some outweighing good; but if it is not necessary for some outweighing good then he could not allow it in light of his omnibenevolence. So if we can find one or two instances of gratuitous evil, we would have a pretty good case against the existence of God. The difficulty is in establishing the one or two instances of gratuitous evil. Atheologians typically go about this by identifying particular cases of horrendous suffering (e.g. Street’s case study of the young girl who was decapitated in a car accident and whose mother held her decapitated head until the emergency services arrived) and making inductive inferences. If it seems like a particular instance of suffering was not logically necessary for some greater outweighing good, then it probably is a case of gratuitous suffering and probably does provide evidence against the existence of God. This is where skeptical theists enter the fray. They dispute the inductive inference being made by the atheologians. They deny that we have any warrant (probabilistic or otherwise) for going from cases of seeming gratuitous evil to cases of actual gratuitous evil. They base this on an analogy between our abilities and capacities and those of God. We live finite lives; God does not. We have limited cognitive and evaluative faculties; God does not. There is no reason to think that what we know of morality and the supposed necessity or contingency of suffering is representative of the totality of morality and the actual necessity or contingency of suffering. If we come across a decapitated six-year old and her grieving mother then it could be, for all we know, that this is logically necessary for some greater outweighing good. It could be a necessary part of God’s plan. This position enables skeptical theists to avoid the problem of evil, but according to its critics it does so at a cost. In fact, it does so at several costs, both practical and epistemic. I won’t go into detail on them all here since I have written a lengthy series of posts (and another published paper) about them already. The gist of it is that we rely on inductive inferences all the time, especially when making claims that are relevant to our religious and moral beliefs. If we are going to deny the legitimacy of such inferences based on the cognitive, epistemic and practical disparities between ourselves and God, then we are in for a pretty bumpy ride. Two examples of this seem apposite here. First, as Erik Wielenberg and Stephen Law have argued, if we accept the skeptical theist’s position, then it seems like we have no good reason to think that God would be telling us the truth in his alleged revealed texts. Thus, it could be that God’s vision for humanity is very different from what is set out in the Bible, because he has ‘beyond our ken’ reasons for lying. Second, if we accept the skeptical position, then it seems like we will have to embrace a pretty radical form of moral uncertainty. If I come across a small child in a forest, tied to a tree, bleeding profusely and crying out in agony, I might think I have a moral duty to intervene and alleviate the suffering, but if skeptical theists are correct, then I have no good reason to believe that: there could be beyond-my-ken reasons for allowing the child to suffer. In light of epistemic costs of this sort, critics believe that we should not embrace skeptical theism. A. Appealing to Disparities: Skeptical theists highlight disparities between humans and God. These disparities relate to God’s knowledge of the world and his practical influence over the world. B. Blocking the Inductive Inference: Skeptical theists use those disparities to block certain types of inductive inference, in particular inferences from the seemingly gratuitous nature of an evil to its actually gratuitous nature. C. Significant Epistemic Costs: The critics of skeptical theism argue that embracing this position has some pretty devastating epistemic costs. It is my contention that all three of these features have their analogues in the debate about superintelligent machines and the existential risks they may pose. I start by looking at the analogues for the first two points. The disparities one is pretty easy. Typical conceptions of a superintelligent machine suppose that it will have dramatic cognitive and (possibly) practical advantages over us mortal human beings. It is superintelligent after all. It would not be the same as God, who is supposedly maximally intelligent and maximally powerful, but it would be well beyond the human norm. The major difference between the two relates to their supposed benevolence. God is, according to all standard conceptions, a benevolent being; a superintelligent machine would, according to most discussions, not have to be benevolent. It could be malevolent or, more likely, just indifferent to human welfare and well-being. Either way, there would still be significant disparities between humans and the superintelligent machine. [T]he first superintelligence may [have the power] to shape the future of Earth- originating life, could easily have non-anthropomorphic final goals, and would likely have instrumental reasons to pursue open-ended resource acquisition. If we now reflect that human beings consist of useful resources...and that we depend on many more local resources, we can see that the outcome could easily be one in which humanity quickly becomes extinct. (1) The first mover thesis: The first superintelligence, by virtue of being first, could obtain a decisive strategic advantage over all other intelligences. It could form a “singleton” and be in a position to shape the future of all Earth-originating intelligent life. (2) The orthogonality thesis: Pretty much any level of intelligence is consistent with pretty much any final goal. Thus, we cannot assume that a superintelligent artificial agent will have any of the benevolent values or goals that we tend to associate with wise and intelligent human beings (shorter version: great intelligence is consistent with goals that pose a grave existential risk). (3) The instrumental convergence thesis: A superintelligent AI is likely to converge on certain instrumentally useful sub-goals, that is: sub-goals that make it more likely to achieve a wide range of final goals across a wide-range of environments. These convergent sub-goals include the goal of open-ended resource acquisition (i.e. the acquisition of resources that help it to pursue and secure its final goals). (4) Human beings consist of and rely upon resources for our survival that could be used by the superintelligence to reach its final goals. (5) A superintelligent AI could shape the future in a way that threatens human survival. I’m glossing over some of the details here but that is the basic idea behind the argument. To give an illustration, I can appeal to the now-classic example of the paperclip maximiser. This is a superintelligent machine with the final goal of maximising the number of paperclips in existence. Such a machine could destroy humanity in an effort to acquire more and more resources for making more and more paperclips. Or so the argument goes. But, of course, this seems silly to critics of the doomsayers. We wouldn’t be creating superintelligent machines with the goal of maximising the number of paperclips. We would presumably look to create superintelligent machines with goals that are benevolent and consistent with our survival and flourishing. Bistro knows this. The real problem, as he points out, is ensuring that a superintelligent machine will act in a manner that is consistent with our values and preferences. For one thing, we may have troubling specifying the goals of an AI in a way that truly does protect our values and preferences (because they are interminably vague and imprecise). For another, once the AI crosses a certain threshold of intelligence, we will cease to have any real control over its development. It will be much more powerful and intelligent than we are. So we need to ensure that it is benevolent before we reach that point. So how can we avoid this existential threat? One simple answer is to engineer superintelligent machines in a controlled and locked-down environment (a so-called ‘box’). In this box — which would have to replicate real world problems and dynamics — we could observe and test any intelligent machine for its benevolence. Once the machine has survived a sufficient number of tests, we could ‘release’ it from the locked-down environment, safe in the knowledge that it poses no existential threat. The Treacherous Turn Problem: An AI can appear to pose no threat to human beings through its initial development and testing, but once in a sufficiently strong position it can take a treacherous turn, i.e. start to optimise the world in ways that pose an existential threat to human beings. The AI could take a treacherous turn in numerous different ways. These are discussed by Bostrom in his book and mentioned by me in my paper. For instance, it could ‘play dumb’ while in the box, i.e. pretend to be less intelligent or powerful than it really is; or it could ‘play nice’, i.e. pretend to be more benevolent and human-friendly than it really is. It could do these things because, as Bostrom puts it, playing nice or playing dumb could be convergent goals for an AI that wants to get out into the real world and realise its true goals. Okay, that’s enough on Bostrom’s doomsday argument and the treacherous turn. It is time to take stock and see how this summary of the argument reveals the analogy with the position taken up by skeptical theists. In essence, what has happened is that critics of Bostrom’s argument have appealed to an inductive inference to block the appeal of his argument. They have claimed that repeated empirical testing of an AI which reveals its seeming benevolence would provide us with good evidence of its actual benevolence. And Bostrom has responded to that argument by blocking the inference from what seems to be the case in the ‘boxed’ environment to what is really the case. He has done so by appealing to the long-term strategic planning of the AI, as evinced in the concept of the treacherous turn. This is directly analogous to the move made by skeptical theists. Thus, we have the first two parts of our analogy. What about the third? Is it the case that accepting the possibility of the treacherous turn has significant epistemic costs? I argue that it does. In fact, I argue, somewhat paradoxically, that Bostrom’s reliance on the concept gives rise to both a reductio of his position or an a fortiori. In other words, I think that if you grant the concept of the treacherous turn, you either end with a reason to reject Bostrom’s argumentative framework (and hence a reason to be slightly more optimistic about the construction of superintelligent machines). Or you end up with a reason to be even more worried than Elon Musk. I’ll explain by describing the general nature of the epistemic costs. One thing we have to bear in mind when considering the epistemic costs of believing in the treacherous turn is that, unlike the epistemic costs of believing in skeptical theism, the scope or impact of those costs will be less widely felt. God, if He exists, is the creator and sustainer of everything. Consequently, everything we see, hear, observe and sense bears his imprint. A superintelligent AI, if one were to exist, would not affect everything in the same way. But that doesn’t mean that the epistemic costs are not significant. I think we can see this by considering some of the ways in which Bostrom develops the notion of the treacherous turn. In addition to thinking that a superintelligent AI could play smart or play dumb, Bostrom thinks that there is a very narrow window of time in which to detect whether or not the AI is going to take a treacherous turn. He refers to this as the moment of the conception of deception. This is the moment when the AI realises that some deception is necessary if it is to achieve its long-term goals. [H]aving had this realization, the AI might move swiftly to hide the fact that the realization has occurred, while setting up some covert internal dynamic (perhaps disguised as some innocuous process that blends in with all the other complicated processes taking place in its mind) that will enable it to continue to plan its long-term strategy in privacy. I believe that this type of thinking means that all our interactions with AI need to be clouded in a pretty deep and possibly paralysing suspicion. We need to be on the look out for this ‘moment of the conception of deception’, but do we have any idea what this might look like? In the paper, I suggested that it is possible that one of our existing AI projects has already crossed through this threshold. Maybe, for example, IBM’s Watson has developed to this point and is currently ‘playing dumb’, biding its time before its human creators give it more practical powers and unleash it on the world. After all, we haven’t been on the lookout for the moment of the conception of deception. It sounds silly, of course, but fanciful speculation of this sort seems to be where this style of thinking leads us. Now, I have been criticised for taking this line in the published version. Kaj Sotala suggested to me (on Google Plus) that I was being unfair to Bostrom (and others) in pushing such an extreme interpretation of the treacherous turn. He thinks we can be pretty confident that no existing AI project has crossed such a threshold because we know a lot about how such systems work. I am willing to concede this point: I was pushing things too far in the paper. Nevertheless, I still think the epistemic costs are significant. I still think that if we follow Bostrom’s reasoning we should be extremely skeptical of our ability to determine when the threshold to the treacherous turn has been crossed. Why? Because I suspect we have no good idea of what we should be looking out for. Thus, if we are going to be seriously trying to create a superintelligent AI, it would be too easy for us to stumble into the creation of a superintelligent AI that is going to take the treacherous turn without our knowledge. And what are the broader implications of this? Well, it could be that this all highlights the absurdity of Bostrom’s concerns about the limitations of empirical testing. It does seem like taking the possibility of a treacherous turn seriously commits us to a fairly radical form of Humean inductive skepticism, at least when it comes to our interactions with AIs. This is the reductio argument. Conversely, it may be that Bostrom is right to reason in this manner and hence we have reason to be far more suspicious of any project involving the construction of AI than we currently are. Indeed, we should seriously consider shutting them all down and keep our fingers crossed that no AI has taken the treacherous turn already. This is why I think believing in the possibility of the treacherous turn has some pretty significant epistemic costs. The analogy with the skeptical theist debate is complete. I am going to leave it there lest this summary ends up being as long as the original paper. To briefly recap, I think there is an interesting analogy to be drawn between the debate about the existence of God and the debate about the existential risks posed by a superintelligent AI. In the former debate, skeptical theists try to block a certain type of inductive inference in order to save theism from the problem of evil. In the latter debate, Nick Bostrom tries to block a certain type of inductive inference in order to underscore the seriousness of the risk posed by superintelligent machines. In both instances, blocking these inductive inferences can have significant epistemic costs. Read the full thing for more. 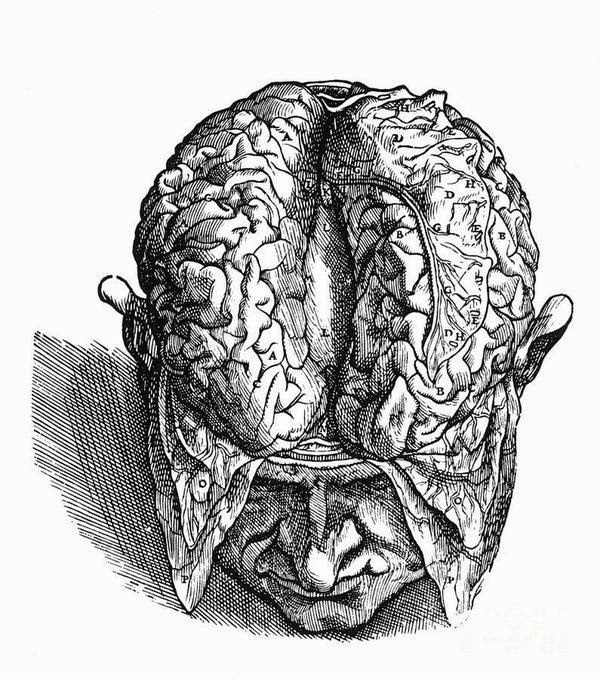 The extended mind hypothesis (EMH) holds that the mind isn’t all in the head. While it is no doubt true that the majority of our cognitive processes are situated in our brains, this need not be the case. For example, when performing the cognitive act of remembering, I may rely entirely on the internal activation of particular neural networks, or I could rely on some external prompt or storage device to assist my internal neural network. According to some philosophers, the extension of cognitive processes into the external environment is what gives rise to the EMH. As Andy Clark puts it, we are all “natural born cyborgs” - agents whose minds are jointly constituted by biological and technological materials. Some philosophers dispute the EMH. Two of the most vociferous critics are Fred Adams and Kenneth Aizawa. They take particular umbrage at Clark’s claim about the possibility of joint-constitution. They believe that cognitive processes are more than likely confined to the brain (or particular subregions of the brain). They argue that the best currently-available psychological and neurological theories support this view. Central to their critique is something they call the coupling-constitution fallacy, which holds that proponents of the EMH mistake coupling relationships for compositional relationships. In this post, I want to do two things. First, I want to try to explain the coupling-constitution fallacy and how Adams and Aizawa make use of it in their critique of the EMH. Second, I want to look at a response to their critique from the philosophers Don Ross and James Ladyman. As we shall see, Ross and Ladyman use this response as an opportunity to make some interesting points about the relationship between philosophical metaphysics and scientific theory-building. Metaphysicians are fond of classifying the different types of relationship that can hold between different ontological entities. Some relationships are causal, some are acausal. Some relationships are temporal, some are atemporal. Some relationships are contingent, some are necessary. And so on and so forth — the metaphysical game continues, forever refining, analysing and reclassifying. Coupling relationship: This is a causal relationship. One entity or event is said to be coupled to another whenever there is a causal connection between them. For example, there is a coupling relationship between the light switch on my wall and the lightbulb in my lamp. Pressing the switch causes the bulb to light-up. Constitutive relationship: This is a compositional relationship. One entity or event is said to be composed of another type of entity or event whenever the latter makes up the former. The classic example here is the relationship between the substance we call “water” and the chemical molecule we call H2O. The former substance is said to be composed of (or constituted by) the later. Another way of understanding the distinction would be the think of vertical and horizontal relationships. Coupling relationships are, in effect, horizontal because they involve ontological entities interacting with one another across the same level of reality; constitutive relationships are vertical because they show how entities from lower levels make up entities from higher levels (note: this is far from perfect as there may be such a thing as bottom-up or top-down causation). Anyway, Adams and Aizawa argue that in making the case for the EMH, philosophers like Andy Clark mistake coupling relationships for constitutive relationships. In other words, Clark thinks that just because the human brain is coupled to some external object, and because the combination of those two objects produces some cognitive result, it follows that the cognitive result is constituted by the brain and the external object. But this does not follow. The fact that A and B, when coupled, cause C, does not mean that A and B constitute C. This is true even if A and B are always coupled. Frequency and reliability of coupling does not imply constitution. To apply this to a particular example, consider Clark and Chalmers’s famous Otto thought experiment. In this thought experiment, we are asked to imagine a man named Otto who has some memory impairment. To make up for this impairment, he always carries with him a notebook containing information that he will need. To ‘remember’ something he simply looks up the relevant page of his notebook and retrieves the information. This occurs on a regular and near-automatic basis. Consequently, Clark and Chalmers argue that Otto’s cognitive process of remembering is spread out between his brain and his notebook. Adams and Aizawa respond by arguing that this example confuses coupling with constitution. It may be true that Otto’s brain and Otto’s notebook are closely coupled, and that this coupling helps to bring about the act of remembering (though that interpretation is itself controversial). It does not, however, follow that the act of remembering is jointly constituted by the brain and the notebook. This is the essence of the coupling-constitution fallacy. That isn’t the end of Adams and Aizawa’s critique. They go on to state that in order to make a proper constitutive claim, we would need a proper theory of the “mark of the mental”. They offer some proposals in this regard that they think lend support to the brain-bound view of the mind. But I don’t want to focus on those proposals here. Instead, I want to limit my focus to the coupling-constitution fallacy and consider a possible response. Don Ross and James Ladyman are two philosophers of science. They wrote a book called Everything Must Go a few years back which critiqued traditional metaphysics and defended a theory called “ontic structural realism” (OSR). This is an interesting theory which, if I could crudely summarise it, argues that structures and relations (mathematically described) are more fundamental than objects or substances. In other words, when thinking about the nature of something like the hydrogen atom, what is really important are the dynamic and mathematically described relationships between entities we call electrons and protons, not the electrons and protons themselves. At least, I think that’s what the theory holds. Ross and Ladyman expound this theory at considerable length in a series of papers and books, and try to illustrate how it applies to various fields of scientific inquiry. In a paper entitled “On the Alleged Coupling-Constitution” fallacy, they transfer some of their insights to the EMH debate, in particular arguing against Adams and Aizawa’s use of the coupling-constitution fallacy. This is not because they are staunch defenders of the EMH, but because they object to the attempt to use a poorly-defined metaphysical relationship to limit the scope of cognitive science. In the paper itself, they offer several arguments against Adams and Aizawa. I just want to focus on one of them. Ross and Ladyman argue that the coupling-constitution distinction is attractive to philosophers reflecting upon the nature of the world from ivory-towers; it is not one that finds any real purchase in practical scientific inquiry. Indeed, the distinction is largely based on an inaccurate and metaphorical view of the world. We shouldn’t let such a view contaminate our approach to the science of cognition. The problem is that metaphysicians (and others) approach their investigation of the world with a set of biased cognitive frameworks (metaphors) already in place. These frameworks have been explored by cognitive scientists such as George Lakoff. Lakoff has famously used these frameworks to explain different styles of political argument. For example, he suggests that people approach their relationship with the state using the frame of parent-child relationships. That is to say, they view themselves as being like the children of the state. And since different groups have different evaluative assumptions about what is appropriate in parent-child relationships, they also have different assumptions about what is and is not appropriate behaviour from the state. For example, conservatives might view the state as akin to an authoritarian father figure; whereas liberals might view the state as being akin to a nurturing mother. I am not sure how credible Lakoff’s political theories are. I know that he has used his analysis of cognitive ‘framing’ to make claims about how liberals and progressives should pitch the policy proposals. But I believe he has found relatively few supporters. In any event, that’s all by-the-by. What’s important here is how the theory of cognitive frames applies to the debate about the extended mind. One of the main cognitive frames — and one that Ladyman and Ross thinks infects the scientific worldview — is the containment metaphor. This views the world as though it were akin to a bucket (or container) that is filled with objects which change their properties over time. In the simplest terms, the world is a container filled with tiny billiard-ball type objects that collide and bounce off one another. The emergent properties of all these ‘microbangings’ is what gives rise the world which we know and understand. So their position is clear. The containment metaphor is misleading, however appealing it may be. The fundamental structure of reality can only be captured in mathematical models; it cannot be reduced to simple metaphors. Now, I don’t know how accurate or fair Ladyman and Ross are being in this characterisation of modern physics. What they are saying sounds plausible, particularly in light of the controversy over the correct interpretation of quantum mechanics. I will simply concede this premise to them and move on to address the central question: what significance does this have for the debate about the EMH? The answer to that question lies in Adams and Aizawa’s use of the coupling-constitution distinction in their critique of the extended mind. Remember, their claim is that proponents of the extended mind confuse the plausible view that the mind is coupled to features of the external world, with the less plausible view that the mind is constituted by elements of the internal and external world. (1) The coupling-constitution fallacy relies on the containment metaphor: i.e. the belief that reality can be accurately modeled in terms of containers, comprised of little things, banging off one another. (2) The containment metaphor is misleading: the fundamental structure of reality cannot be captured by homely metaphors of this sort, it can only be captured by mathematical models. (3) Therefore, the coupling-constitution fallacy is misleading. This argument has some complexities and subtleties. For one thing, its broader implications for the debate about the extended mind are left unclear. Obviously, the belief is that it undercuts one leading objection to the notion of an extended mind, but this, of course, does not mean that the extended mind hypothesis is plausible. Ladyman and Ross offer some mild endorsement of the extended mind hypothesis toward the end of their article, but it is clearly not their purpose to defend it. They are focused solely on the merits of the coupling-constitution fallacy. The other complexities in the argument arise from the defence of premise (2) and its connection to the defence of premise (1). One of the standard examples of a compositional relationship, mentioned above, is the water-H2O example. The metaphysical claim here is that the substance water is made up of (constituted by) H2O molecules. Adams and Aizawa use examples of this sort to motivate their application of fallacy. It is pretty clear how this standard metaphysical account appeals to the containment metaphor. A bucket of water is consists of tiny little things (molecules) banging off one another in various ways. …[T]he kind water is an emergent feature of a complex dynamical system. It makes no sense to imagine it having its familiar properties synchronically. Rather, the water’s wetness, conductivity, and so on all arise because of equilibria in the dynamics of processes happening over short but non-negligible time scales at the atomic scale. From the point of view of any attempted reductive explanation, the kind water is not held by physicists to be ‘constituted’ as opposed to ‘caused’ because it is not a substance in the classical metaphysical sense. And, as they go on to point out, this dynamical account of water applies equally well to the explanation of the atomic and sub-atomic particles of which water is said to be comprised. It is not a nested layer of containers filled with stuff, all the way down. It is a set of dynamical processes, only capable of being described by mathematical models. This is why premise (2) seems be fair. The one potential criticism of premise (2) is that it appeals too much to the state of play in physics; and not to the state of play in other special sciences. Thus, a defender of the coupling-constitution fallacy might concede that the traditional metaphysical distinctions no longer apply to the models used by physicists, but argue in reply that this has no bearing on the models used in the special sciences. And since the human mind is described and modeled by the special sciences (cognitive science, psychology etc. ), that is where we should focus our attention. Those models still appeal to causal-constitutive distinctions, and so the criticism still applies. Ladyman and Ross argue that this is no good. There are two problems. First, it may be true that special sciences appeal to causal-constitutive distinctions, but there is no reason to think that those distinctions have any legitimacy outside of their reliance on the containment metaphor (which is alleged to be misleading). Second, we can appeal to ‘theoretically mature’ special sciences in which models are constructed but which highlight how misleading the causal-constitutive distinction can be. A good example of such a mature special science (though some may dispute the appropriateness of the label) is economics. Economists construct complex mathematical models of various phenomena of interest (e.g. the behaviour of consumers on the insurance market; the relationship between employers and employees in the employment market). At first glance, it can appear as though the systems being described by these models rely on traditional causal-constitutive distinctions, i.e. one system is ‘made-up’ of another, or forms part of another, or is comprised by agents and actors at ‘lower levels’ of reality. But this is not quite right. The systems described are all model-relative. They are distinguished by reference to sets of endogenous and exogenous variables (i.e. variables that are ‘internal’ and ‘external’ to the models). Most economists will admit that there are multiple ways of carving up the sets of endogenous and exogenous variables, all of which can be appropriate for different explanatory purposes. Ladyman and Ross think that the same could be true of a theoretically mature cognitive science. The scientists could construct models to explain and predict different mental phenomena. Those models could appeal to different parsings of endogenous and exogenous variables and in doing so there is no reason to think that they need treat the brain-bone barrier as a fundamental ontological barrier between what is part of the mind and what is not. To sum up, in this post I have looked once more at the debate about the extended mind hypothesis. In particular, I have looked at one of the leading critiques of the notion that the mind can extend into the world beyond the brain. The critique came from the work of Adams and Aizawa. It claimed that proponents of the extended mind hypothesis are guilty of committing the coupling-constitution fallacy. That is, they confuse a causal relationship between the mind and the external world with a constitutive relationship between the mind and the external world. I also looked at a response to the critique from the work of Ladyman and Ross. Applying their general philosophy of Ontic Structural Realism, Ladyman and Ross argue that traditional metaphysical distinctions — such as the distinction between coupling and constitution — have no place in modern science. They are products of a misleading cognitive frame that we apply to reality. A mature cognitive science would not rely on such on archaic distinction. Consequently, they think the coupling-constitution fallacy is no real threat to proponents of the extended mind hypothesis. This doesn’t mean that the hypothesis is correct; it just means that this particular objection to it is not enough to dissuade us from pursuing it further.